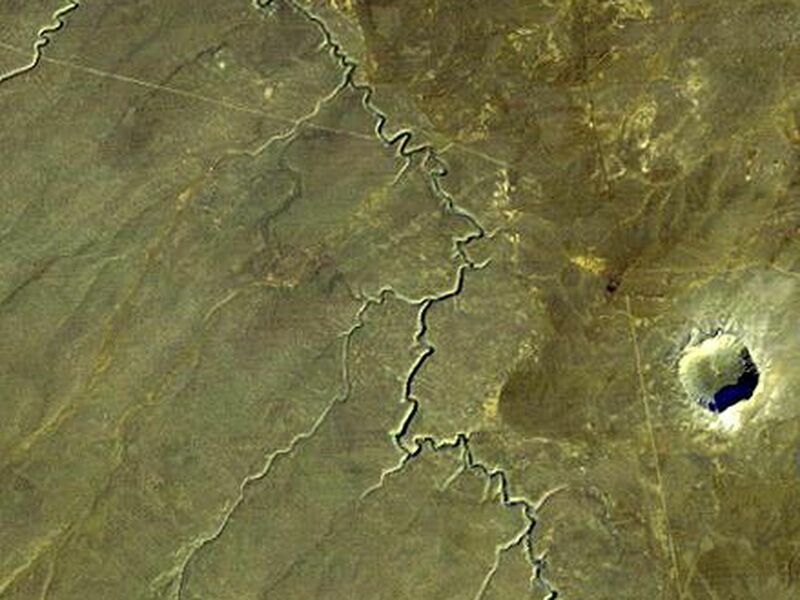 Barringer Crater, also known as "Meteor Crater," is a 1,300-meter (0.8 mile) diameter, 174-meter (570-feet) deep hole in the flat-lying desert sandstones 30 kilometers (18.6 miles) west of Winslow, Arizona. Since the 1890s geologic studies here played a leading role in developing an understanding of impact processes on the Earth, the moon and elsewhere in the solar system. This view was acquired by the Landsat 4 satellite on December 14, 1982. It shows the crater much as a lunar crater might appear through a telescope. Morning sun illumination is from the southeast (lower right). 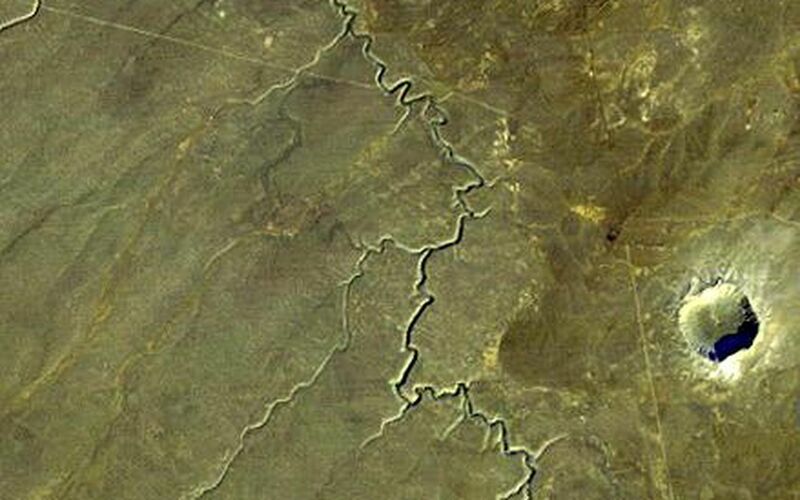 The prominent gully meandering across the scene is known as Canyon Diablo. 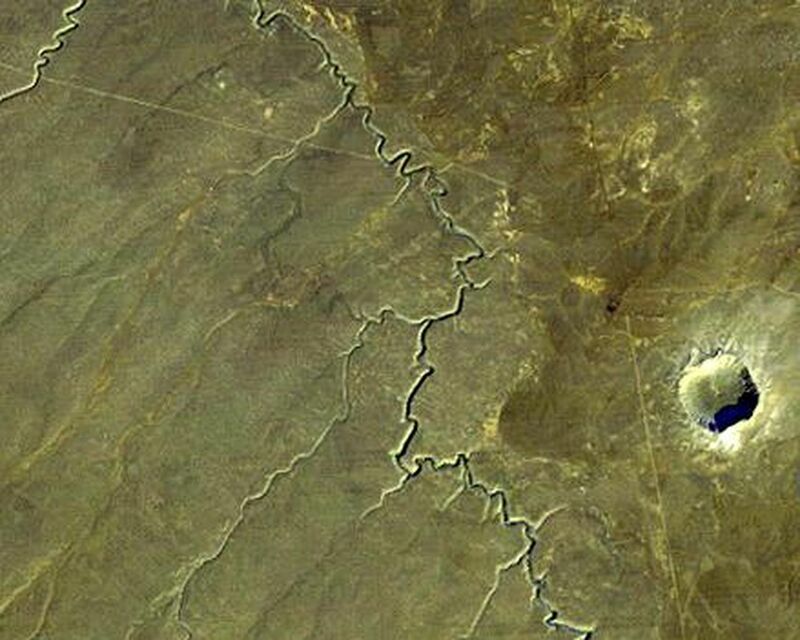 It drains northward toward the Little Colorado River and eventually to the Grand Canyon. The Interstate 40 highway crosses and nearly parallels the northern edge of the scene. The ejecta blanket around the crater appears somewhat lighter than the surrounding terrain, perhaps in part due to its altered mineralogic content. 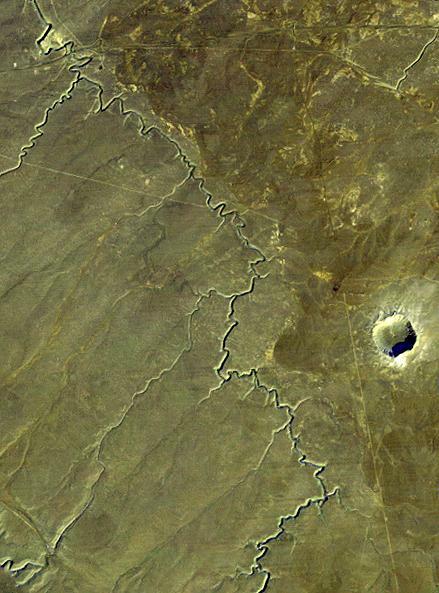 However, foot traffic at this interesting site may have scarred and lightened the terrain too. Also, the roughened surface here catches the sunlight on the southerly slopes and protects a highly reflective patchy snow cover in shaded northerly slopes, further lightening the terrain as viewed from space on this date.